The Afghan Women’s Educational Training Center was established to teach poor women and girls how to read and write up to the 3rd grade level. The main goal is to help these students become self-sufficient through literacy and income generating skills. The students attend both literacy and vocational training classes such as sewing, needlework and hairdressing. 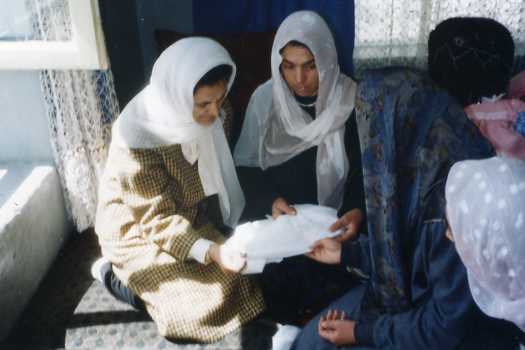 The SHARE Institute donated a mini-grant to the Afghan Women’s Educational Training Center to further support training programs in sewing for widowed women. The SHARE Institute funded a mini-grant for the Afghan Women’s Educational Training Center to support the continuation of the sewing and needlework classes that ensure the self-support of Afghan women. The SHARE Institute funded an additional mini-grant an additional mini-grant to help single and widowed mothers pay for prescriptions and medical care for their sick children.